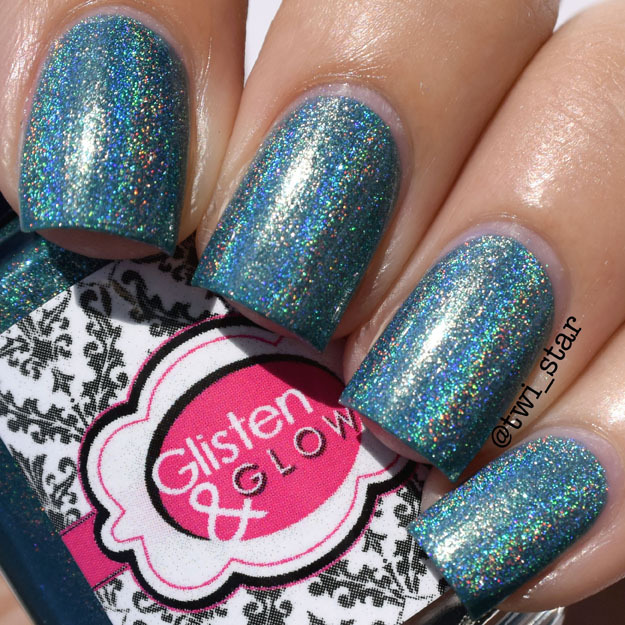 twi-star | Nail Art Blog: Glisten & Glow Clubbin' Teal Dawn - July 2015 A Box, Indied swatch review! So you can get a good feel for this polish, here is ‘Clubbin’ Teal Dawn’ under my daylight lamps. You can still see some of the holo but not as strong as when in the sun. And here it is in the shade, not as exciting but really what polish is exciting in the shade. And now let’s see them all together just because we can! The deets on how to get this polish: A Box, Indied is a monthly polish sub box featuring some of the biggest and hottest brands in the Indie polish world. The July A Box, Indied will be available on June 26th, follow @aboxindied for swatches and updates. One thing that I love about holo polishes is that I always feel like they’re complete without any nail art ha! Which sounds a bit crazy coming from me, but I love this polish on its own. How about you? 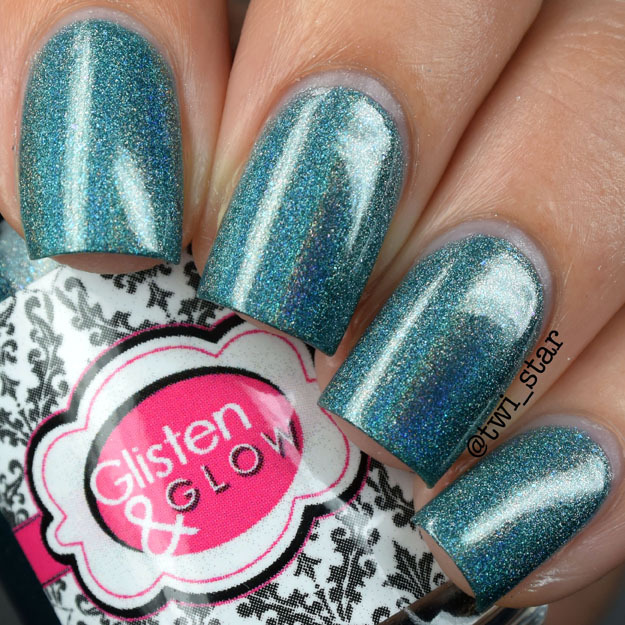 How do you like wearing your holos? Can't wait for this, it is gorgeous! Loving this color! Great swatch! Thank you so much, real polish always makes me happy when I wear it! Could you stop being perfect? Thanks... ;) Seriously though, amazing swatches as always. I love that turquoise flash! Love it! Especially in the shade! Thank you! I really couldn't find anything I didn't like about this color, it's just perfect! I' ve never thought I was into holos as I can't do much art over them. I've totally been missing the point. They don't need art! This is droolsworthy! I really love the color of this dusty teal. 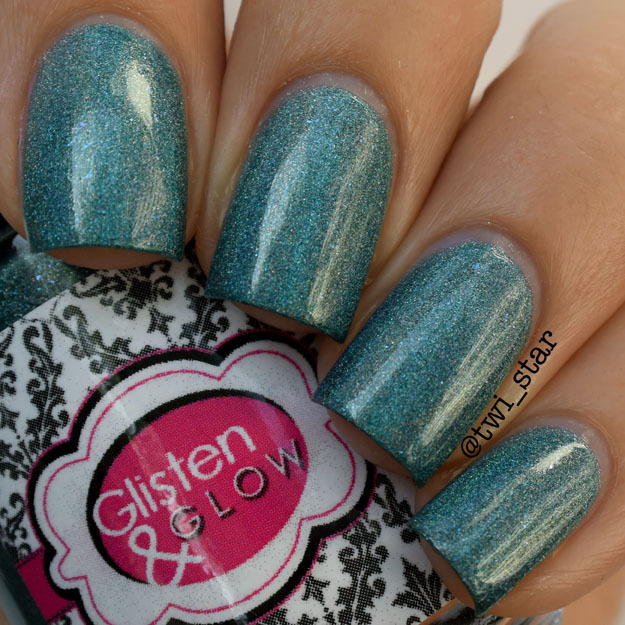 Another fabulous colour from Glisten & Glow! I have a hard time doing nailart over holos too - both are stunning on their own I feel they cancel each other out lol Gorgeous polish!! That holo! Gorgeous <3 I tend to do very simple nail art over holos if I do any at all. I think sometime the nail art can be distracting and cover up the gorgeous base. The sun picture puts the other one to shame! It's so full of holo wonder and beauty. Love your swatches as always! Thanks for showing it in all of its different lights/modes! I swatch in my driveway too (and I live on a busy street), and I'm sure random passerby think I'm nuts. I can't wait to see all the colors for the July A Box, Indied- they're always so great!